For the first time a spacecraft, the MESSENGER – MErcury Surface, Space ENvironment, Geochemistry, and Ranging – a NASA spacecraft, is orbiting Mercury, the planet closest to the Sun. The spacecraft assumed orbit at 8:45 P.M. EDT on March 17, 2011 (12:45 AM, March 18, 2011 UTC) at about 96 million miles from Earth. MESSENGER orbit is highly elliptical with the closest point about 200 km above the surface and the farthest point about 15000 km. It will complete one revolution around Mercury in 12 hours. The science phase of the mission is expected to begin on April 4, 2011. High-Resolution View from Mercury Flyby 1 of MESSENGER. Image credit: NASA. Designed and built by Applied Physics Laboratory of Johns Hopkins University, Maryland, MESSENGER was launched on August 3, 2004, by a Boeing Delta II rocket from Cape Canaveral, Florida. It had flew by Earth once, in August 2005, twice by Venus, in October 2006 and June 2007, and three times by Mercury, in January 2008, October 2008 and September 2009, before it entered the current Mercury orbit. These flybys were necessary for MESSENGER to go into orbit around Mercury with minimal amount of on board fuel and a relatively small launch vehicle because tremendous amounts of energy is needed to slow down the spacecraft before it enters an orbit. During the Earth flyby the spacecraft used Earth’s gravity to readjust its trajectory closer to the Sun and a Deep Space Maneuver moved it further into a trajectory to flyby Venus. After the two Venus flybys the trajectory was further adjusted to be closer to Mercury, with assistance from Deep Space Maneuver. Finally, the three low-altitude Mercury flybys put MESSENGER into an orbit around Mercury, with help from course correction maneuvers. The previous Mercury mission was Mariner 10, a flyby by Venus and Mercury, launched in 1973. There were three flybys, the first one was on March 29, 1974, with the closest approach at 700 km passing on the shadow side. The second encounter occurred on September 21, 1974 and was at a distance of 48,000 km in the southern hemisphere. The third and final flyby was the closest, at a distance of 327 km above the surface and passing near the north pole. 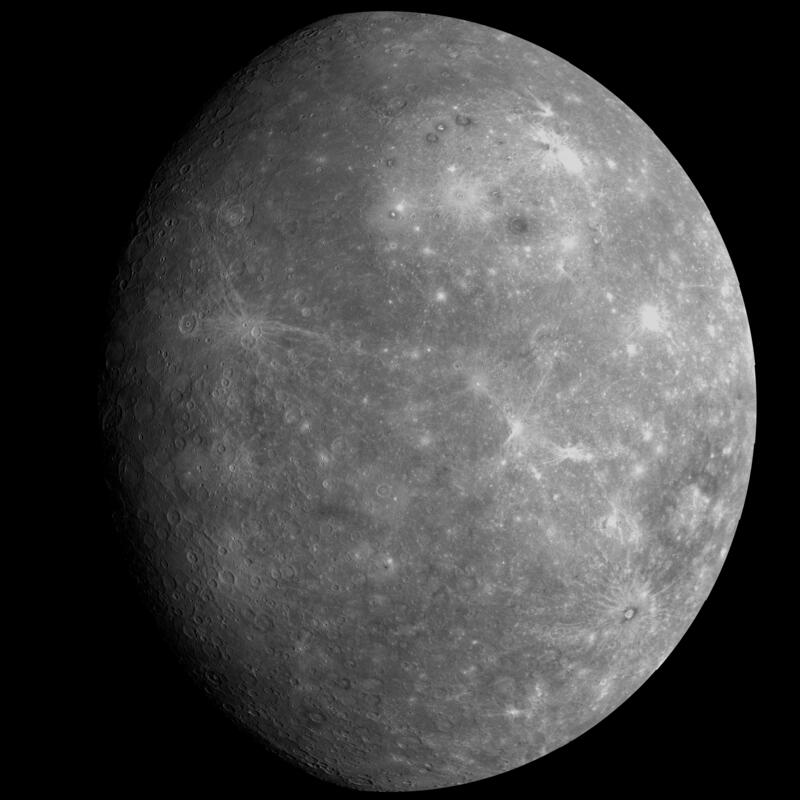 During the three encounters Mariner 10 was able to map about 45% of the surface of Mercury, discovered that it has a tenuous atmosphere consisting of helium, sodium and oxygen, a magnetic field that is 100 times weaker than that of the Earth and has an iron rich core that takes up most of its volume. Mariner 10 also measured the daytime and nighttime temperatures of Mercury as 430 and -183 ° C, respectively. The poles never receive sunlight since the rotation axis of Mercury is nearly perpendicular to the plane of its orbit. Therefore, the temperature at the poles remain about -160° C. The surface of Mercury resembles that of the Moon with numerous craters but it shows a unique feature called scarps or long cliffs that spans hundreds of kilometers in length and about 100 m to 1.5 km in height. These are considered as thrust faults formed as a result of cooling and shrinking of the planet. The spacecraft carried seven instruments on board: magnetometer, television cameras, infrared radiometer, plasma analyzer, extreme ultraviolet spectrometers, instruments to measure charged particles and radio wave propagation. Mercury has a diameter of 4879 km (in comparison, the diameter of Earth is 12,756 km and that of the Moon is 3475 km). The gravitational force is only 37% of that on Earth. Mercury has an orbital period of 87.9 earth days and a rotation period of 58.6 earth days, about 2/3 of its orbital period. It is normally visible during morning or evening twilight as it’s largest angular separation from the Sun is only 28.3°. Mercury does not have any natural satellites. It is in an elliptical orbit around the Sun with 46 million kilometers at perihelion and at 70 million kilometers at aphelion. -to study Mercury’s mass distribution by measuring slight changes in MESSENGER’s orbital velocity around Mercury. Why is Mercury so dense? What is the geologic history of Mercury? What is the nature of Mercury’s magnetic field? What is the structure of Mercury’s core? What are the unusual materials at Mercury’s poles? What volatiles are important at Mercury?